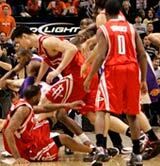 The NBA, "Where you don't mess with Shaq happens." After watching the Phoenix Suns last night, it is clear they are sinking faster then the Titanic. They were blown out on national television by the Rockets. Granted, the Rockets are becoming a really good team but I thought the Suns had some fire left...guess I was wrong. In other news, my "twin" Rudy Fernandez continues to impress, with 25 points off the bench! I hope everyone picked him up when they had a chance, unless you're in a league with The StreakMaster, because it's too late. The LPGA starts our day off with a "lower first round" matchup between Paula Creamer and Annika Sorenstam. Both golfers are projected to finish in the top five of this event, so expect a close one here. In our first college football game at 7 p.m. ET, the Akron Zips host the Buffalo Bulls, with the home team favored by three points. The MLS conference finals start at 7:30 p.m. ET, with the highly favored Columbus Crew hosting the Chicago Fire in the Eastern Conference Finals. With the over/under set at 2.5 goals, The StreakMaster put up a "total goals" prop. The NFL Thursday night game features a battle for first place in the AFC East when the Patriots host the surging Jets. The Pats are favored by three in this one and even though the Jets have been impressing The StreakMaster, he is siding with New England. In a huge ACC game, the Hokies look to steal a win on the road against the Hurricanes (-4). Both teams are 6-3 and have a chance to win the conference title. It should be a close one and since it's a Thursday night game, who knows what will happen. Streakers struggled today, ending the day with a 37.9 overall winning percentage. The top streak breaker was Liverpool, who was drastically outplayed by Tottenham in their Carlin Cup matchup. sfniners_1 leads the way with 19 wins in a row.